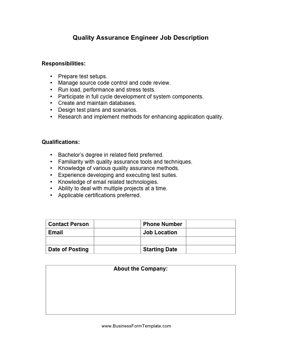 Perfect for warehouse, shipping and delivery companies, this quality assurance engineer job description covers necessary qualifications, certifications and experience. Manage source code control and code review. Run load, performance and stress tests. Participate in full cycle development of system components. Design test plans and scenarios. Research and implement methods for enhancing application quality. Familiarity with quality assurance tools and techniques. Knowledge of various quality assurance methods. Experience developing and executing test suites. Knowledge of email related technologies.